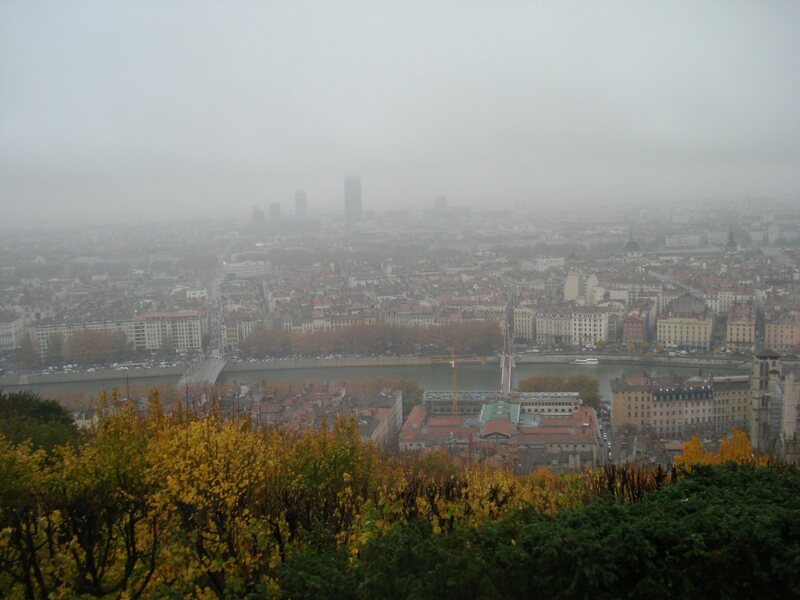 At the point where the Saone and Rhone rivers meet lies the city of Lyon. It is France’s second largest city with 1.2 million inhabitants. 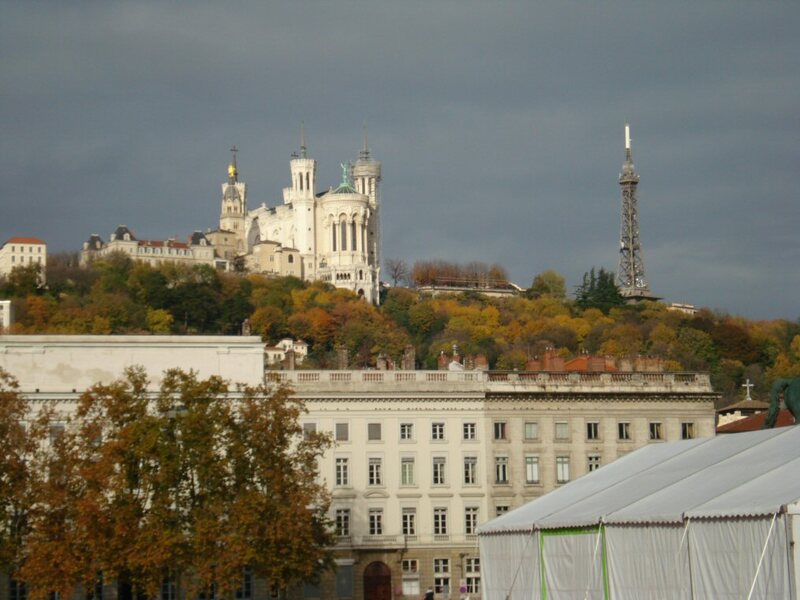 High upon Fourviere Hill sits the Fourviere Basilica, a church dedicated to the Virgin Mary, patron saint of Lyon. 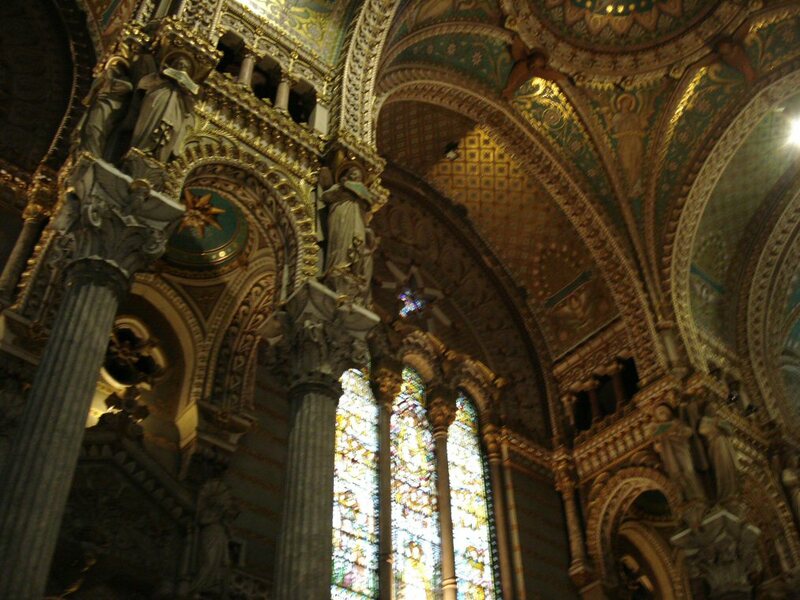 In the Roman Catholic Church, a basilica is a designation for an i mportant church building that carries special spiritual, historical and architectural significance. 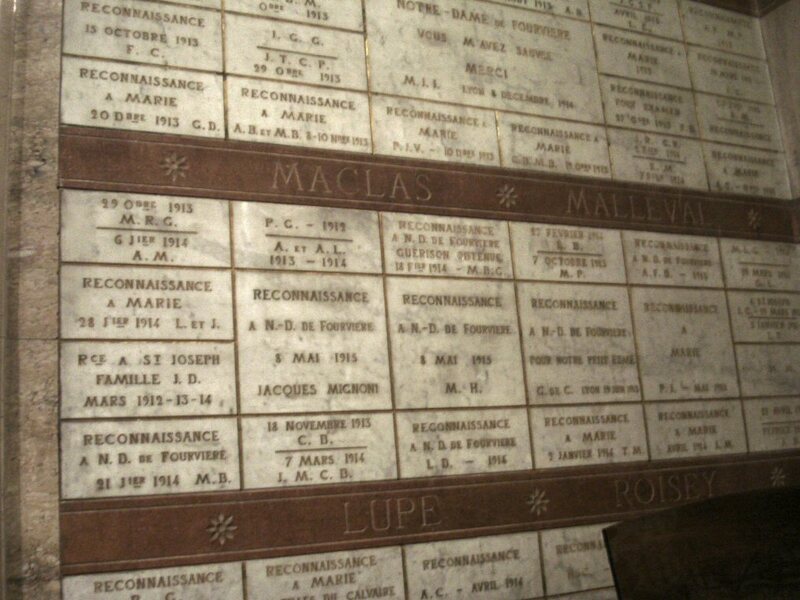 The designation is assigned by the Pope. And once a basilica always a basilica. The word basilica comes from the old Roman basilicas which were houses of law. A cathedral is a church that has a bishop’s throne called a cathedra and is the center of the diocese. A church is a building where public mass is held and an oratory is more like a chapel where private mass is said. 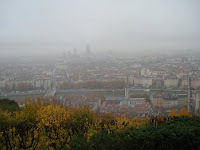 Arriving at the top of Fourviere, we opened umbrellas and tried to imagine what a wonderful view of the city we would have if it would only stop raining. Inside the basilica was ra ther dark since there was no sun streaming in the impressive stained glass windows. The place was huge though. Probably one of the largest houses of worship I’ve ever been in. 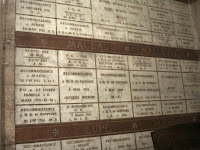 Downstairs, was the crypt where hundreds of military and other significant people are buried and memorialized. The crypt was every bit as big the sanctuary above. On our trip to the old town, we passed by several multi-storied buildings with false fronts painted on them. 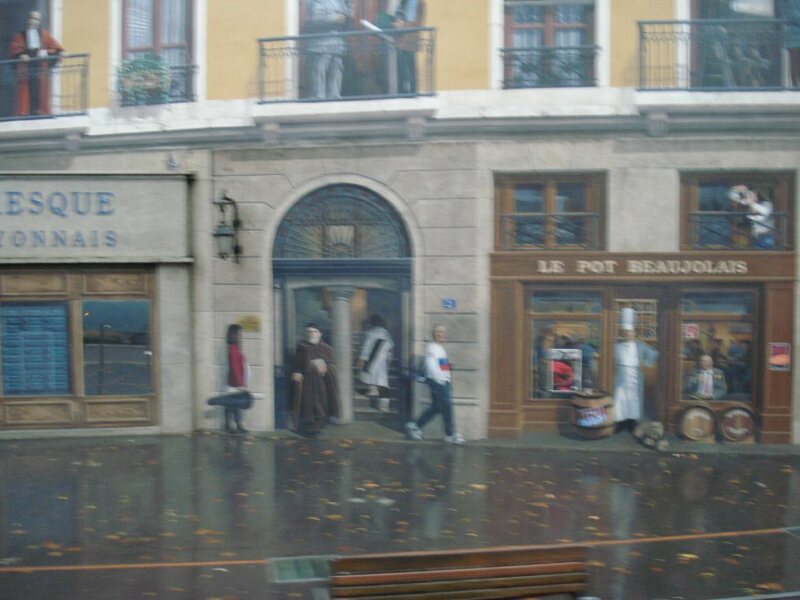 These are called trompe l’oeil and often depict famous people. 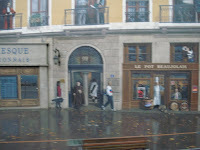 The people are painted life-sized on the facades and through a misty rain from a distance, look real. A walk t hrough old town might have been better had we had a better guide and it wasn’t in a miserable light rain. The streets there are very narrow, the buildings interesting and often little courtyards that were beyond large original doors led to the entrances to old apartment buildings that were just now beginning to have their own plumbing according to our guide. We overnighted in Lyon so we took the opportunity to eat early for a change (on the riverboat dinner was usually at 7 or 7:30). The only place we found that looked good to us and was open early was a pizzeria that also had Italian food. It seems we ate Italian food more often in France than regular French fare. 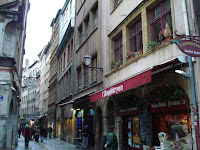 The next morning we had some time to explore in a little better weather the city center of Lyon which has a huge pedestrian area with lots of shopping. Again, the prices of things were comparable to Paris and way more than I was willing to fork our. I’m just not a shopper. 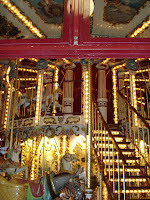 We did find a wonderful fountain and a two-storied carousel! 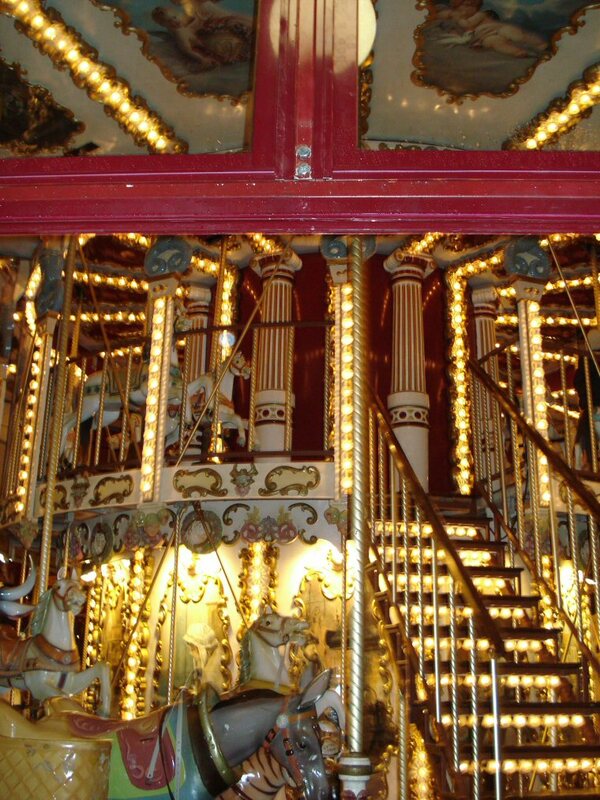 The two-storied carousels seem to be very popular in France. While Lyon is probably a very nice city on a good weather day, we still agreed; we enjoy the little towns much more. 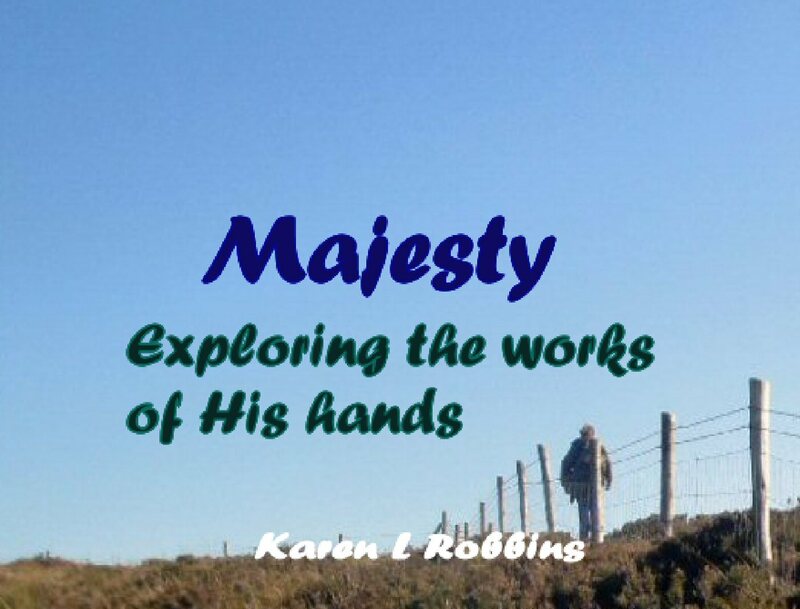 Thank your for taking me away! Your blog is better than a handful of Calgon bath oil beads!!! You're welcome Patti! It's the only way I can fit everyone in my suitcase.